I had finished December finals and was all prepared and ready to go home for the holidays. After my two-hour trip back to the GTA I was greeted by my family and boundlessly energetic chocolate labradour retriever (it’s no secret that he is the one I miss the most when away at school). The whole traditional Christmas routine was to follow: baking cookies, Christmas mass, a large Christmas dinner. After all these festivities, my family and I went up North to visit relatives. It had only been a few days since December 25th when I began to get an itch in my throat. At the time it felt like nothing could be worse. Clearly that’s not true. Nevertheless I had an itchy, scratchy, sore throat that a little cough syrup or a drink of water couldn’t seem to fix. I tried everything: cough drops, salt water gargle, ginger tea… but it was persistent. It quickly spread into a full-blown head cold with total congestion. It took a little over two weeks to overcome this passing sickness. Two weeks may not seem that long and a cold may not seem that serious but to a person with chronic illness , it can be pretty scary… and create a bad case of paranoia. I started thinking to myself, Oh great, on top of everything else, I have a head cold. A cold seems to exacerbate my chronic symptoms and can even sometimes create new ones, leading to an increase in my daily discomfort. This causes me to think things like: When will this end? Will I be okay for the beginning of the new term? What if my symptoms exceed that which I can handle at school and will I lose the semester? Of course a train of thought like this quickly spirals into panic… and insomnia from the discomfort of being sick leads to exhaustion (not like I’m not already tired in the first place). Fatigue is a major cause for increases in the severity of my symptoms, doubling my panic. When a person with chronic illness gets a cold, it isn’t just a matter of having a cold and waiting for it to pass – it influences many other factors that affect our health and wellness. For example, when someone I live with gets sick (or a bug seems to be going around campus) my housemates know that I’ll be Lysoling doorknobs and light switches and sanitizing our house. I may also appear a little more distant if you have a cold. These are things that many people do during cold and flu season, so my housemates know that it’s not because I’m crazy – merely attempting to avoid distress. If you have a cold (I know it’s not fun and not fair to you) but please be respectful of everyone else’s health… you just never know what the consequences of a cold could mean to someone around you. I remember one year, near the end of exams, I was studying in the basement of Douglas Library and a first year student was clearly sick – sniffling, coughing, and wiping his nose on his sleeve due to his lack of Kleenex. Of course he was sitting in the cubicle attached to mine. The library wasn’t particularly packed that day, but all I kept thinking, Why did you pick to sit beside me? Please don’t get me sick! 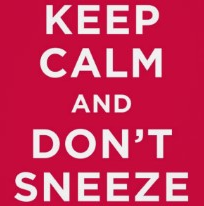 Please, please don’t sneeze on me! ← A poem for invisible women.